Bidding on a solar RFP can be tough for developers and installers: you need to propose a PPA rate without knowing if an investor will finance that rate. SolRiver Capital solves this problem completely – we tell you the PPA rate you need to secure an investment from us before you respond to the RFP. By partnering with us, you can confidently put together financeable PPA terms in your next solar bid. We even provide several tools to help in the bidding process, which we discuss below. SolRiver offers a PPA Rate Finder calculator, sample bankable PPA contracts, buyout pricing schedules, and more. Below, we go over how each of these tools can help you. We recommend using all of SolRiver’s available resources next time you’re responding to an RFP. 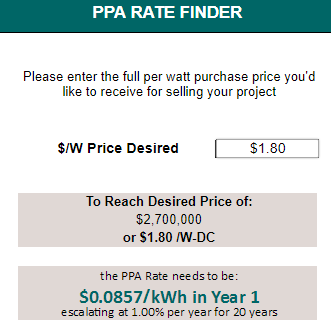 The Rate Finder solves for the PPA rate needed to hit a desired funding amount. First, fill out a handful of project-specific variables like system size and production. Then, enter the Purchase Price you want to receive from SolRiver. The Rate Finder shows you the PPA rate you need to get that price. What is a PPA Buyout in Solar? 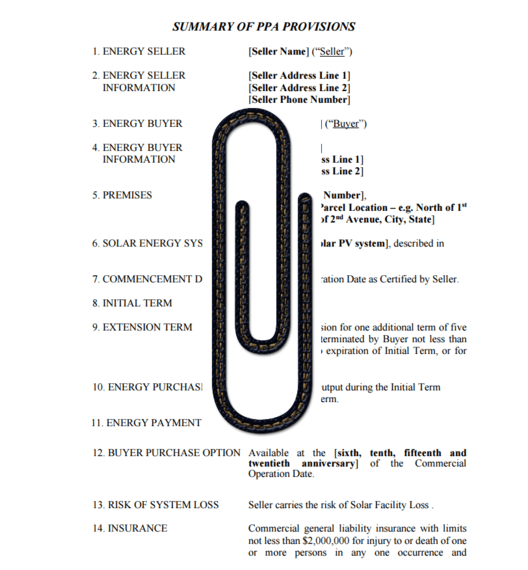 A solar PPA buyout is an option for the offtaker to purchase the solar project before the PPA ends. The price of the buyout is the greater of the fair market value or a predetermined price. It’s common that offtakers have this option in year 6, 10, 15, and 20. Some PPA’s have a continuous buyout option. SolRiver Capital also provides PPA buyout price schedules. RFP’s frequently request a PPA Buyout Option This can make bidding tough because you need to propose a buyout schedule without knowing if it’s financeable. Partnering with us solves this problem too – we tell you the buyout price you need to get the full investment from us. To discuss buyout terms for your bid, you can send us an email or simply fill out the form below. Drop us a line, we’d be happy to discuss the opportunity with you. Please let us know if you submitted a bid with us in mind, so we can support you if we are contacted by the offtaker. We provide PPA contract terms in our Contract Library when an RFP calls for an example agreement.